Ben Knight is an artist who lives and works in Brooklyn, NY. He has collaborated extensively with Associated Artists for Propaganda Research. He has lectured at Hallwalls Contemporary Arts Center. His artwork was shown extensively with the late Willoughby Sharp. He is currently helping editing a book of interviews with the artist and former jewel thief, Jimmy Sadoski. When he is not working in his studio he currently works for the United Nations in NYC. The title of The Reddest Shift, refers to the red shift, a cosmological phenomenon: light that travels to our planet from distant galaxies gets stretched because the space that it passes through is expanding, a process that is said to have started with the Big Bang. The physicality of an interstellar “happening” in a domestic and architectural space confronts the truth of how powerless and small we, as humans, are when we are compared to scaled galactic facts. 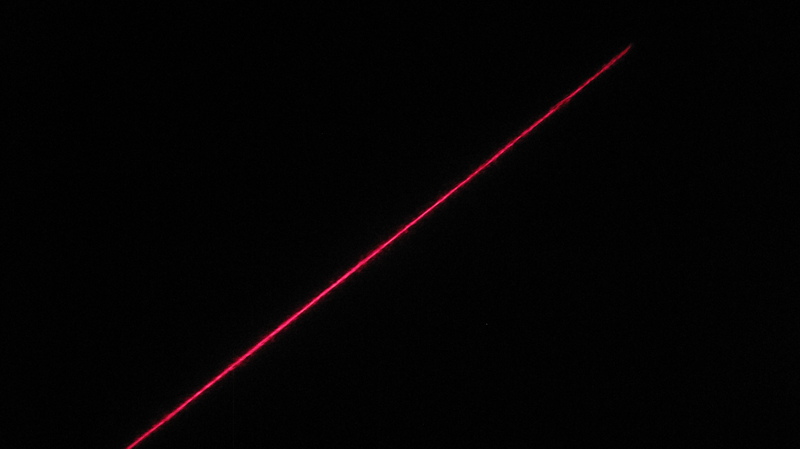 Like all my light work, the laser is refracted creating a maximal experience which expands to its limits on a flat wall space, or is condensed or minimized when an object/body is in front of it. Also like all my light related work, it is powered by stored solar energy via solar panels, which are present with all the displayed light work.